The Accidental Advocate is on hiatus as we transition to our new blog found at www.codss.org/blog. All of our current and future blog posts will be published there, so drop in, give us a visit, and stay in touch. Although Central Ohio Down Syndrome Society has been operating for a little more than a year, we have made astonishing gains on behalf of Down syndrome families, including convening our own scientific advisory panel and retaining our own legislative lobbyist (we were recently credited by the NDSS as being the only known local Ds group in the country to ever do so). And with your help and support, we will continue our mission to advance Ds research and legislation in ways that have not been done in decades. For more information on what we’re doing to move Ds research and legislation forward, give us a call at 866.568.8949. After six months of development, CODSS has proudly launched Phase I of its new online home at www.codss.org. The site will serve as a focal point for bringing Down syndrome families, researchers, policy makers, and advocates together, and as a hub for cross-sector efforts to keep Down syndrome research and advocacy center stage, now and in the decade to come. Codss.org is sophisticated, organized, elevated, professional and contemporary, and is the product of thoughtful, intuitive design. To read more about how codss.org was developed and designed, click here. But codss.org is more than just a website; its the anchor of a larger digital strategy that you will see unfold in the coming weeks. Share the site with your friends, family, co-workers, others who support children and adults with Down syndrome. Also, send us any thoughts or feedback that you have so we can make it stronger and more useful to you. Please note that in the weeks to come, The Accidental Advocate Blog will be folded into the blog at our new codss.org website, which you can find here. We are acutely aware of how the current economic environment limits opportunities for our children with Down syndrome to access physical, occupational, and speech/language therapeutics and support. Because these skills are central to the development of thinking, reasoning, remembering, as well as social inclusion and integration, CODSS is committed to meeting this emerging need. That’s why I am so excited to inform you that yesterday the Country Club of Muirfield Village Foundation awarded CODSS a grant totaling $9,000 to help support a brand new initiative that will give Ds families increased access to physical, cognitive and language development services. The CODSS Childhood Intervention Program is a pilot initiative designed to: 1) increase access to physical, occupational, and speech therapeutics and support that help bridge the gap with county-provided services; and 2) foster continual development and achievement by further educating parents on how to confidently and consistently reinforce therapies for their child while at home. The CODSS Board of Directors is enthusiastic about this program and eager to launch it as it will provide our children with Down syndrome a solid foundation of critical skills that will allow them to live meaningful and more independent lives. Complete details will follow in the New Year on how you and your child can participate in this exciting new, first-of-its-kind pilot program for Ds families. Many, many thanks to the entire Country Club of Muirfield Village Foundation Board for believing that our work together will have an enduring impact on every child and adult with Ds that we are able to touch. Thanks also to many of you for your continued support, and for making our inaugural year a tremendous success! Several weeks ago, I received a phone call from Madeleine Will, vice president of Public Policy & director of the National Policy Center at National Down Syndrome Society requesting Central Ohio Down Syndrome Society’s help in securing the support of Ohio U.S. Senator Sherrod Brown for the Trisomy 21 Translational Research Parity Act that was just introduced into Congress. Within days of receiving the request from NDSS, CODSS held direct discussions with Senator Brown’s office, and was able to secure not only Senator Brown’s support but his agreement to co-sponsor this very important bill. This is a tremendous first step for all individuals and families living with Down syndrome, but there is more work to be done. That’s why NDSS has asked CODSS (the only Ds organization in Ohio) to sit on a small 5-person executive committee that will help guide strategy on enacting the Trisomy 21 Translational Research Parity Act. NDSS has also asked CODSS to lead the effort in Ohio to secure the support of the entire congressional delegation. This is the real work, folks. This is the type of result and achievement that you demand of us as your organization. We should all take pride in the fact that CODSS was directly responsible for Senator Brown co-sponsoring this bill, and huge kudos need to go to CODSS legislative lobbyist, Dean Fadel, who made this possible. Last night, Central Ohio Down Syndrome Society hosted a small reception for Dr. Michael Harpold, CEO of the Down Syndrome Research & Treatment Foundation. We’re honored Michael flew in for this whirlwind one-day visit to meet specifically with CODSS board directors and member families, and to meet with our research partners at Nationwide Children’s Hospital and The Ohio State University, including: Drs. Dan Coury, Bill Smoyer, Eric Butter, Chris Timan, and Terry Elton. Michael and I have talked extensively over these many months, and it is clear he shares our ideals, and hopes for the future. He also believes, just as we do, that the status-quo has been a disservice to our children with Ds, and that there must be more substantive progress and commitment in forwarding Ds research. To this end, CODSS & DSRTF have agreed to work in partnership to increase awareness and support for break-through, evidence-based, cognitive research initiatives that will allow our children with Ds to lead meaningful and more independent lives. This is truly an exciting time in Ds research, and you will hear much more in the coming months. I invite you to learn more about the Down Syndrome Research & Treatment Foundation at http://www.dsrtf.org. Last evening, Central Ohio Down Syndrome Society hosted a small reception for Dr. Michael Harpold, CEO of the Down Syndrome Research & Treatment Foundation. 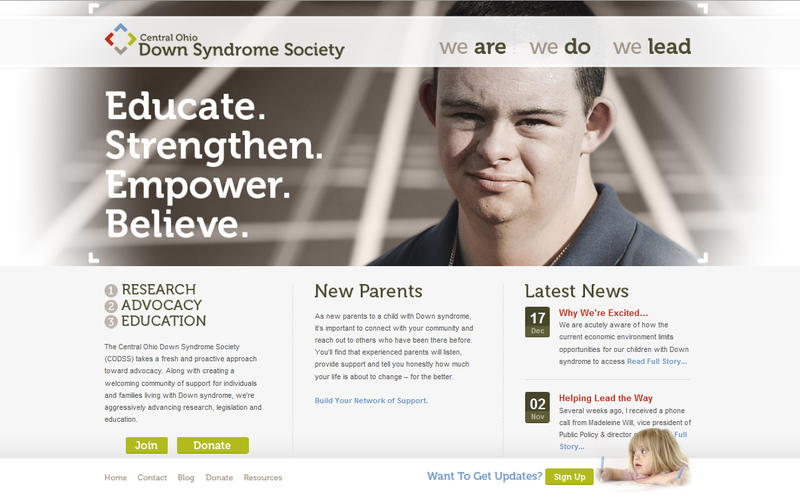 I invite you to learn more about the Down Syndrome Research & Treatment Foundation at www.dsrtf.org. Ohio’s long standing lawsuit regarding the free, appropriate, public education (FAPE) of children with disabilities ages three through twenty-one has received a partial settlement agreement today, October 20, 2009. This suit is in the Federal District Court, Judge Holschuh presiding. It is known as John Doe v. State of Ohio. The lawsuit has two parts. The first part is a challenge to the way Ohio funds special education and related services. The second part is a challenge to the Ohio Department of Education’s (ODE) procedures for implementing the Individuals with Disabilities Education Act (IDEA). This lawsuit was brought by parents of students with disabilities in Ohio who want their children to receive FAPE. The second part of the suit is the subject of the partial settlement, the challenges to Ohio’s procedures for implementing IDEA. 1. The way ODE monitors local school districts and other agencies compliance with the IDEA. 2. The way ODE handles school districts’ requests for waivers of state standards controlling the delivery of special education services. 3. The way ODE operates its system for handling complaints about special education matters. 4. The way ODE corrects school districts’ failure to comply with the IDEA. For over a year, the parties have been negotiating an agreement for a partial settlement which resolves the claims about the way ODE implements the federal law, IDEA. The parties have written the agreement in a document called a “Consent Order”. The judge, in a hearing held on October 20, 2009, declared the “Consent Order” final, with regard to the issues above. 1. ODE to provide public involvement and access to information regarding its IDEA monitoring systems. Local school districts must post for public review local districts’ performance and hold open meetings to hear concerns. 2. ODE must provide protections and additional oversight when a waiver to the state requirements for class size are requested by schools. Parents in the district whose children would be affected by allowing the rules on class size, case load and other factors, must now be given notice of requests for such waivers before ODE can decide to give the waiver. Waivers cannot deny FAPE to affected students. 3. ODE must provide additional notice to parents/guardians of the complaint process and advocacy resources when a parent files a state level complaint. ODE is required to conduct a more thorough investigation of complaints which challenge the delivery of FAPE, or a school’s failure to implement due process hearings or state level review decisions, and the inappropriate use of restraints or seclusion. ODE must correct violations of the law in a timely manner. 4. ODE must enforce complaint timelines and mediation cannot delay these timelines. 5. ODE must enforce state and federal standards and require a district to correct failures within one year. Penalties may be applied for failure to correct. This decision is final and the Consent Order is in effect and lasts for 2 years. Ohio’s long standing lawsuit regarding the free, appropriate, public education (FAPE) of children with disabilities ages 3-21, received a partial settlement agreement on October 20, 2009. The lawsuit, known as John Doe v. State of Ohio (which I wrote about in an earlier post here), has two parts: Part 1 challenged the way Ohio funds special education and related services. Part 2 challenged the Ohio Department of Education’s (ODE) procedures for implementing the Individuals with Disabilities Education Act (IDEA). The lawsuit was brought by a plaintiff class of over 250,000 students with disabilities and their parents who want their children to receive FAPE. The partial settlement addresses the second part of the lawsuit which challenges the state’s procedures for implementing IDEA. This decision is final and the Consent Order is in effect and lasts for 2 years. To read the entire Consent Order, go to: http://www.olrs.gov. At Central Ohio Down Syndrome Society, we have a responsibility to ensure children with Down syndrome have regular access to critical services that will help them lead independent and healthy lives. That’s why we’ve partnered with Nationwide Children’s Hospital to provide Ds families free group physical therapy sessions so children with Ds can grow stronger, more mobile and more confident. This is the first program of its kind for Ds families in central Ohio. I wanted to say thank you again for all of your endeavors and for setting up this awesome PT program. Jen is super and I think the PT time we had was very beneficial for Elijah. Loved the opportunity to participate in the group PT session last week. Davis and I really enjoyed the therapist. She was gentle, but energetic; just what I need with my little machine…. Not only did we enjoy the program, but also meeting more families. I loved watching Davis play with Peter Lombardi – currently, Davis doesn’t have any DS peers. Thanks so much for bringing this opportunity to us. Looking forward to next month. The facility was great, well equipped, and Jen was really good with the kiddos. I liked the small group and all the space to let them roam. The obstacle course was a perfect idea for the group… Overall, a great experience. Thank you. I loved the PT session. Thank you again for organizing this. I thought the group size was perfect–there probably could have been an additional child but I appreciated the small size. The therapist was great–very upbeat with many helpful suggestions. I liked how she had organized the session and used the various rooms and equipment…. As a working mother, I struggle with guilt about doing enough for Avery… So having the session on the weekend was quite relaxing and very enjoyable for me… For now, I want you to know how much I appreciate everything that you are doing and I hope to find additional ways to get involved and support this organization.